/ Should I let my Windows 10 Apps Access my Advertising ID? 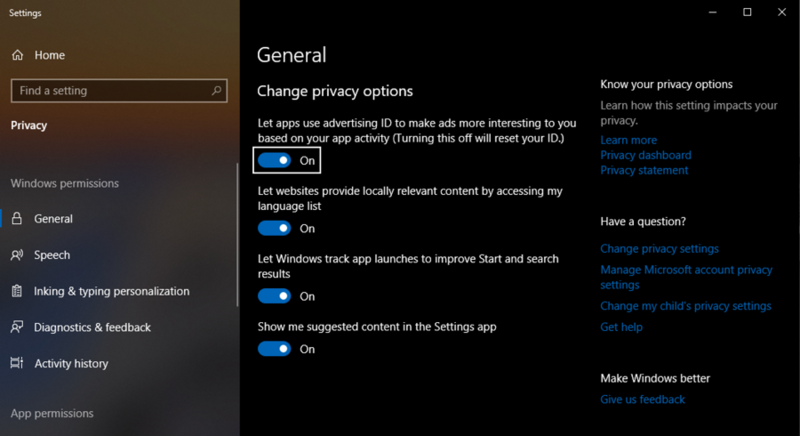 Should I let my Windows 10 Apps Access my Advertising ID? 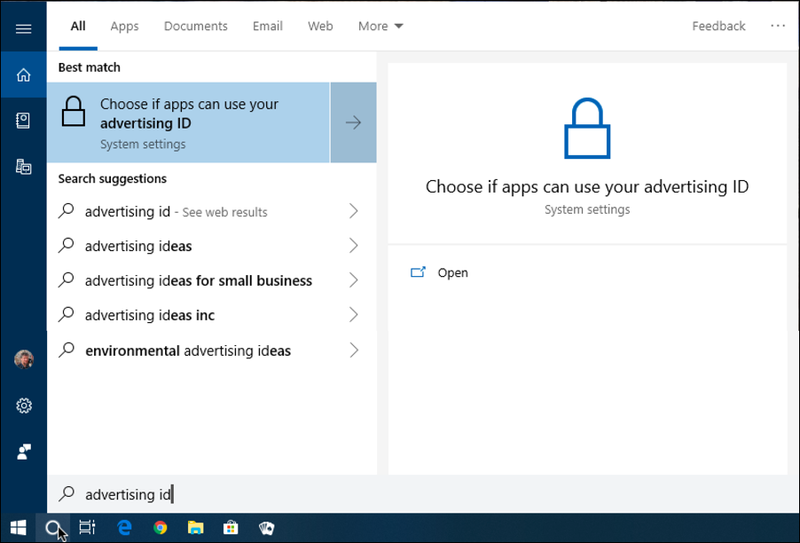 Just learning about “Advertising ID” on my Windows 10 computer and am torn: should I let apps and programs have access to my ID or not? Between your browser ID, what wi-fi networks you can see, your language settings and all of your cookies, it turns out that you’re not too hard to track as you travel around online. From a privacy perspective this might be a good thing or it might be your worst Orwellian nightmare come true. Imagine, whatever you buy, every article you ever read online, every comment on a social post, every share on your mobile device, it’s all tracked and cross-correlated. Look up a book on your smartphone, and you’ll start seeing banner ads for it on your computer within minutes. Microsoft’s “Advertiser ID” (formerly known as the more descriptive but confusing “relevant ads”) does one better by assigning you a unique ID to make all of this tracking even easier. Now before you freak out, realize that the main purpose of it is so that the advertisements that you see are more relevant to your interests and experiences. A single man shouldn’t see diaper ads any more than a pregnant woman shouldn’t be shown funeral insurance deals in an ideal, “smart” advertising world. Turns out that it’s really hard to explore the Internet nowadays without some sort of tracking. It can be done, but you’re going to be using Virtual Private Networks, perhaps the TOR Network, Onion networks (named because of the layers within layers of redirection) and generally going through a lot of work to sidestep everything. And just possibly, that’s more trouble than it’s worth for the majority of us. Microsoft basically shares the bad news when it says that whether or not you opt in to share Advertising ID, you’ll still see the same number of adverts. They’ll just be less likely to be relevant to you. Privacy? Sorry, that’s old school thinking. You can see that Microsoft’s anticipated your interest! Click or tap on “Choose if apps can use your advertising ID“. I’m using “dark theme” which is why this isn’t the standard white background. A mixed bag, but kind of fun to try for a while. Check out: switch to dark theme in Windows 10 if you’d like. The first switch is the one you want: “Let apps use advertising ID to make ads more interesting to your based on your app activity”. Seems like disabling it would give you more privacy, but I’m not convinced it makes that much difference since there are so many other ways that we’re being tracked in Web browsers and generally. Basically it’s not going to reduce how many ads you see, just how relevant they are. Modern online life, I suppose. So they say the right things. But do you trust ’em? As for Advertising ID, well, I guess my recommendation is if you aren’t going to go through greater lengths to increase your privacy online, it’s probably better to just leave it enabled and share your ID with advertisers so you don’t get those awkward feminine hygiene products or funeral insurance plans on the most inappropriate of Web pages. Pro Tip: I have been writing about Windows 10 since, well, it was in early beta. Please check out our extensive Win10 help area for lots more tutorials and handy tips.